← Should I Spend Donuts On the Personalized Talking Astrolabe? What Does it Do? : After the initial quest, both Marge and Maggie have 8hr tasks there. Maggie Have a Baby Dance Battle and Marge Watch a Baby Dance battle. And that’s it my friends, the details on the final two Christmas 2018 prizes! 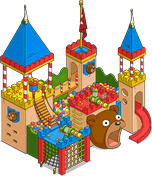 Thoughts on the Toy Fortress? How about on the Greyhound Sleigh? Thoughts on Act 4 prizes? How’d you do with Acts 1-3? What do you think we’ll see next? Sound off in the comments below, you know we love hearing from you! 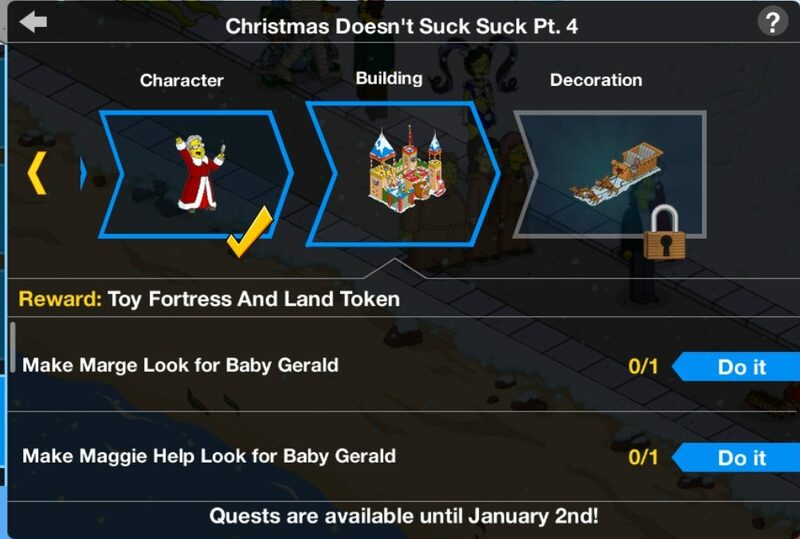 This entry was posted in Decorations and tagged Act 4 prizes christmas, Christmas 2018 Prizes, greyhound sleigh, Tapped Out Christmas Event, Tapped Out Tips and Tricks, task at the christmas tree farm, Task at the Toy Fortress, Task with Grehound Sleigh, The Simpsons Tapped Out, Toy Fortress, TSTO Addicts, TSTO Christmas 2018, TSTO Simpsons Christmas Special, TSTO Tips and Tricks. Bookmark the permalink. I’m surprised no one has mentioned the old Homer costume job where Homer Santa drives the sleigh with all the reindeer dressed as Santa. All 3 in the air is fun. I got the Toy Fortress on Sunday night and the Greyhound Sleigh on Monday night. I like the look of the Toy Fortress and already started a little design for it in my Christmas village area, I just wish it was a little bigger. I love the Greyhound Sleigh and it has to be one of the best animations from this event or even in the game, I’m glad I got it since I passed on Ms. Claws so I don’t see her sleigh task. I also love that this event gave Santa’s Little Helper not one but two outdoor tasks and his sleigh task is the best of the two. Completed all tasks, got the greyhound sleigh but SLH’s action is still locked. Am I missing something? Edit; Figured it out. 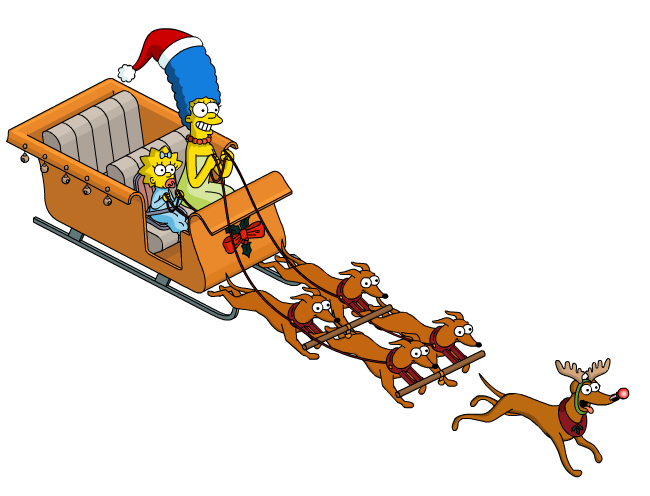 Send Marge & Maggie to drive the sleigh then send SLH to lead it at the same time. Got the Greyhound Sleigh and completed the Marge/Maggie flying task. Really cool animation! However, the Santa’s Little Helper task to “Lead the Greyhound Sleigh” is still greyed out. I am wondering what I missed?? Love the kiddie prizes. They’ll flesh out my small children’s section of itchy & scratchy land. When is the addicts live year in review going to be posted? OMG, the prizes, the animations! What a great event. The cat sleigh; the greyhound sleigh; the new stage with 2, count ’em, 2 character animations (or are there more? ); an animated snow crook? Wow! A home run from my viewpoint. Congratulations! Now, If only I had managed to spend the donuts to get the cat lady in the cat sleigh; but no ….. it disappeared before I got around to it. Will the opportunity reappear (hope, hope)? Happy holidays all! The final prizes are really great. I’ve really liked this Event, this last event of the year is clearly better than the first… we end up the year with a wonderful event… I hope 2019 will be a good year… just wanted to thank you for all your work with your team.